The word ‘vinaigrette’ always throws me off…I always have to look up how to spell it EVERY time I use it. You’d think that common kitchen words would be automatic in my vocabulary but damn, that is a weird one. Why in the word of it not just be spawned from vinegar and be vinegarrette? Am I crazy? I guess so. Well, last week I had the November Wrap Up and one of my winter goals from that post was to start making my own salad dressing. What can I see? I am crazy about homemade staples (see homemade vegetable broth, DIY ketchup, DIY BBQ Sauce, etc etc etc). There is something so satisfying about knowing exactly what is going into your food and to realize how something is actually SUPPOSE to taste instead of what it’s additive infested counterpart has conditioned you to be use to. Take, for example, the homemade ketchup I posted about over a year ago (woah! Such a loooong time ago), you can actually taste that the sauce was made from tomatoes. Crazy, huh? This dressing is wonderful. 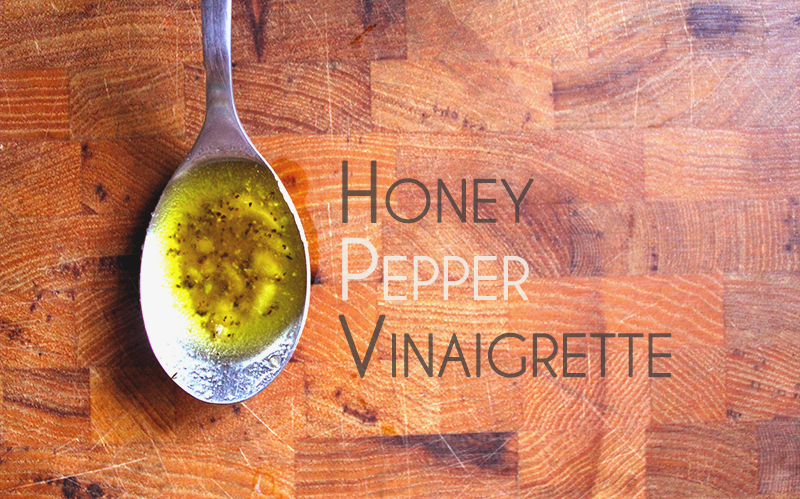 The honey adds the slightest bit of sweet to the otherwise savory salad dressing giving a wonderfully subtle and delicious overall flavor. I topped this over raw kale, carrots, pecans, and onions but I bet this would be great lathered over some grilled asparagus or roasted winter squash! Combine everything in a container with a lid and shake vigorously until everything has blended together. Store in the fridge for up to a week.